Wanting a .308 hunting rifle. Thread: Wanting a .308 hunting rifle. ....another point for keeping the weight down. I like the Leupold 2-7x scopes on hunting rifles to be used inside of 350 yds. 8.2 Oz. and all the scope I need for deer or even coyote size game inside 350 yds. Why add another 1/2-1 lb. for glass capabilities that you will never use. That is a good point about the scope, as long as the one you pick has enough light gathering for dusk or dawn hunting. I used 3x or 4x fixed power back when I hunted. I would second a Savage. My next heavy barrel will be a Savage 10. I would also consider the TC. Have a hard time beating the price/performance on those two. 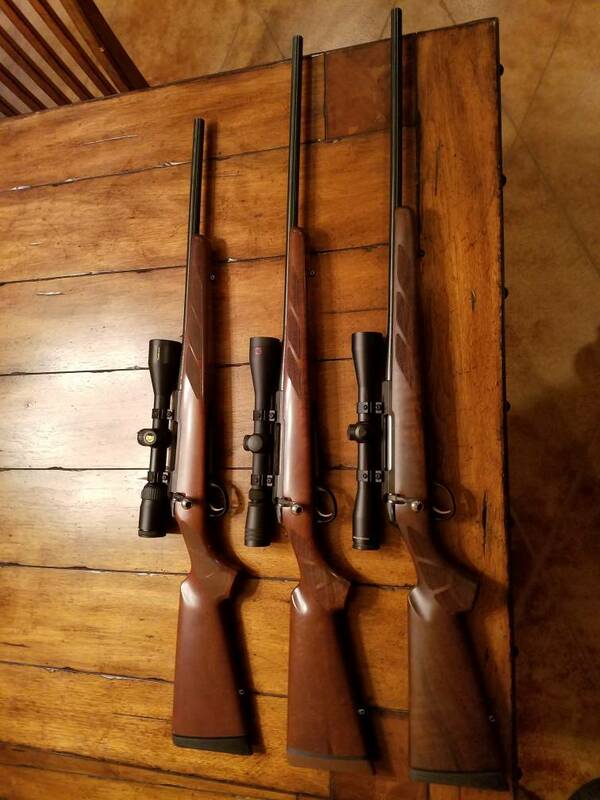 I bought two bolt guns late last year. Either would fit your needs nicely, and both are offered in .308Winchester. First was a Thompson center Compass. Mine is in .243Winchester and is as accurate as I am out to at least 300 yards. That's all the farther I've taken it. Next was Mossberg Patriot. Mine is in .30-06, and it too is a tack-driver with decent ammunition. Price point on both is under $500. As a matter of fact, I believe I paid just less than $200 for the Compass, and right at $400 for the Patriot. I recently bought a Mossberg 308 Patrol rifle with the threaded 16" barrel. It is quite accurate with jacketed and it also likes heavier CB's (180-200's). By taking off the flash hider and putting on the thread protector then using faster burning powders, I have quieted down the blast of the short barrel while retaining the hunting capabilities with those heavy boolits. It is a handy little rifle. Tikka or savage both I'll work well ,trigger and bolt on the tikka are super slick . I had one in 7mm-08. Tack driver. Never used cast with it, mostly Sierra Gameking or Matchking bullets. My first ugly but accurate rifle. Kimber has a few in your specs. Tikka is another on that does a fine job. The Browning Line up includes a lighter weight premium rifle in the hells canyon line. I think consistent 1” groups with 5 shots is doable but will take development with any of the chosen rifles. If you pick up some factory match ammo then it should group less than 1" in the rifle of your choice. When I bought my Savage Axis I was shocked at the 3" groups with batch ammo (.223). Then I got some Federal match (69gn Sierra Matchking) ammo. First 5 rounds went into 3/4 inch. I don't know if they will do better because I can't shoot any better than that, even off a bench. Kimber 84M Montana, and beat your weight requirement by almost a full pound. What I really wanted was a .338 federal. I bought a Ruger American All Weather in .308Win. Even with the cheapest 150gr FMJ surplus ammo I found it was putting 5 round groups into .75". With the Federal Match 168 SMK ammo I could shoot several .5" groups. This little rifle has impressed the heck out of me. It's not a great looking gun but it's an accurate rifle that i'm not afraid to drag through the rain and snow and scrub brush here in NV. I also have a Tikka T3 in 7mm RM and it's another light weight tack driving machine. The Tikka has one of the smoothest actions I've ever cycled. The T3 Hunters are light, accurate , AND pretty. The recoil pads are like boot heels is my only complaint. I am leaning towards a Tikka. The Kimbers have had mixed reviews that give me pause. I am a sucker for a pretty gun that will shoot. I looked at the Ruger No 1 but the only new ones in .308 are anniversary editions that do not move me. I know it is not a bolt gun but a single shot would serve well for my hunting needs. don't like the 308, but I think it's a versatile cartridge. I used the .308 a lot in a Ithaca LSA55, a Sako, and a 788 and that 130 hp flat out works. A man could be a one gun guy with a .308 Win. Like DRM50, my 742 was a lemon but I had a 760 that was great. I would recommend the Ruger American rifle. Mag fed, light, mine is very accurate, and easy on the wallet. If I was to buy another hunting rifle, haha... I mean.. WHEN I buy another hunting rifle it will be a tika t3 lite stainless in .308 or 30-06. Have one in 300 win mag and it will shoot repeatable .33 inch groups at 100y. Awesome rifles, you will not regret buying one.